Liam Dennick Fishing : Sunday 13th March. Back to manor farm for the second time this weekend. Windmill and ash pools in. I felt you needed to be on ash pool to win so was hoping to draw on there. Hand in the draw bag - peg 29 windmill. Not a very good area really as its in the middle of the lake and its deep here, I felt on windmill you needed to draw down the shallow end. Windmill is a pole dominated lake so didn't bother with rods. Had enough time to kit up 5 rigs. 0.15 spider line - to an 0.11 hook length, size 18 B911 to a bait band. 1 rig was just there for chasing fish if I needed to plumb up new lines. 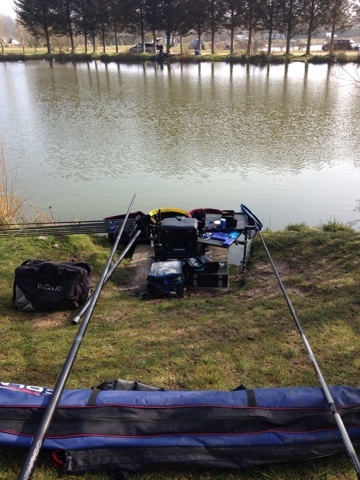 final rig was an edge rig, At 5m to my right I had 4 1/2ft of water so fancied catching down there. At the all in I picked up my pellet rig at 13m and shipped out my Colmic Airon F33 and rattled in 20 4mm pellets hoping for a quick response. 20 minutes passed without a bite after repeating the feeding process every 5 minutes. Minutes later the float slid under and connected to my first fish. A very welcome 2lb F1. Stayed on this line for the next 2 hours and managed to tick over nicely putting 13 f1s in the net. I felt I was doing ok as hadn't seen anyone catch yet! As expected this line soon dried up and found myself plumbing up a new line to my right in the shallowest part of my peg incase the fish wanted to be here. By shallower I mean it's 6" shallower than my other line. Quick look on this saw me have a few more F1s and some Chunky skimmers. Mean time I already fed my edge line and was keen to have a look on it. Lowered my rig in and clunk! 3lb F1 safely in the net, back on this couldn't get a bite! So back out on my original 13m line for a good last hour (hopefully) the next 20 minutes saw me not have a bite! And couldn't catch down the edge! Finally I had a nice run of 3 fish to end the match on 19 F1s. As the scales came round. My fish went 50-12-0. And 55-0-0 winning the lake! So I was second on the lake. In hindsight I think not catching any bonus fish (carp) have let me down a little but onwards and upwards!